I have a question. when I add the eth0 interface to my bridge br0, the outside connectivity goes. In that case how will I send and check the traffic ? first of all I’m sorry I haven’t answered you before but I’ve been away from the keyboard for a few days. If you only have one physical nic (eth0) to the bridge br0 and you create a mirror on it, I think it most probably won’t work. If you prefer you can try to contact me by mail, Google Talk or Skype and you could try to give me more information about what you’re trying to configure. Please check my http://es.gravatar.com/n40lab, I’ll try to do my best to help you. Thanks Miguel for the reply. What time would be good to do skype / gtalk you ? Would it be ok to contact you on US time ? Meanwhile I will try to explain the steps I have done in a mail. My timezone is GMT + 1, and I usually try to be online most of the time 😀 but if you send me an email I’ll answer you as quickly as I can. Thanks for contacting me. I guess that if you add the eth0 port to an openvswitch bridge, you could use it as a mirror source port/destiny port. If you look at the man page for ovs-vsctl you have an example where traffic for two interfaces are mirrored into one interface. I haven’t tested a more complex configuration, but I’m always willing to learn please try to contact me. I think i have the same question with mr.moorthy. Can I join the discussion? Have you tried the same in OpenStack Environment? I tried on openstack.On above cmd for vnet0’s traffic to be mirrored onto vnet2. 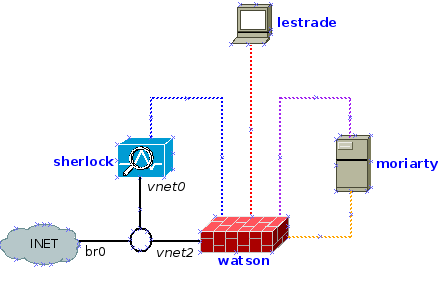 not for vnet2’s traffic to be mirrored onto vnet0. Thanks for your feedback, it’ll help any user that comes by looking for OpenStack’s mirroring. Hi, thanks for reading my blog!. If you want to talk, you can use my personal page and contact me using that form (https://artemit.com.es/contact.php). Cheers!